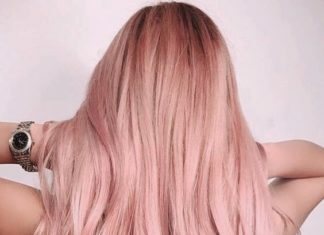 Last year a new hair color began to dominate Instagram feeds. As devoted followers of the pink hair trend saw their hair color fade, they realized that the resultant mixture of blonde, pink, and orange tones was just as gorgeous. 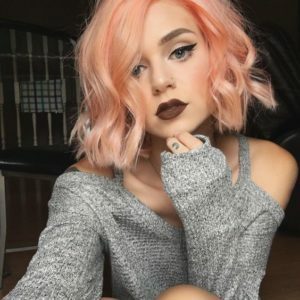 The blorange hair trend was born. 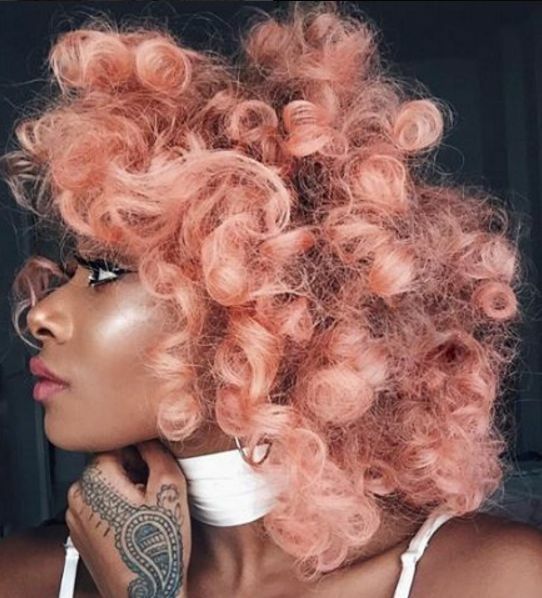 There is so much versatility with the blorange hair trend – you can go subtle and washed out or bold and vibrant. 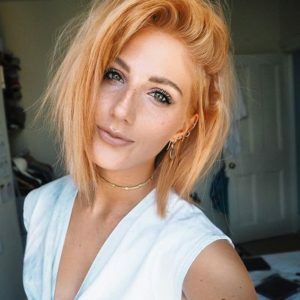 So, if you are looking to bring a little more color into your life, get some inspiration with these beautiful blorange hair color ideas. 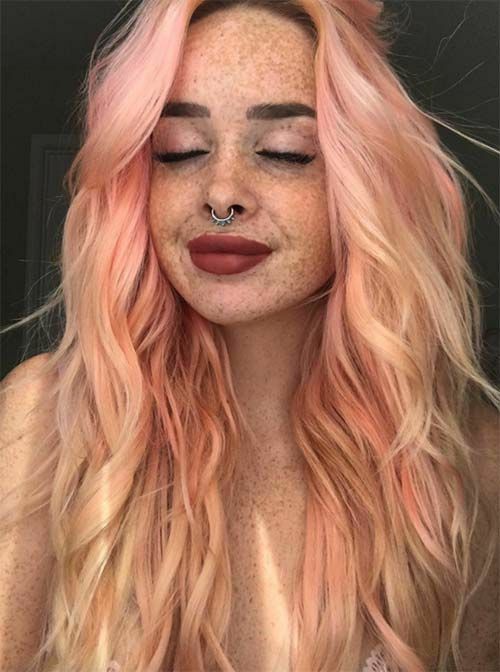 Blorange hair looks stunning against all skin tones and even complements natural freckles beautifully. These beachy waves in an array of blorange shades are so effortless and laid back thanks to a breezy mix of white blonde, soft peach, and pastel pink. Blorange blends perfectly with all natural (and unnatural) hair colors, whether you choose bold or more subtle tones. This brunette to blorange ombre is subtle and natural, but still has plenty of impact. When styled into soft waves the blorange tones really stand out, from strawberry blonde to rose gold. Stunning. 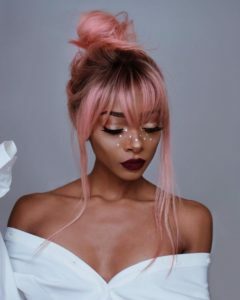 There is so much scope for experimentation in the blorange hair trend. This wavy blorange bob is given extra volume and lifts with dark roots contrasting with copper, peach, and the lightest touch of bubblegum pink. 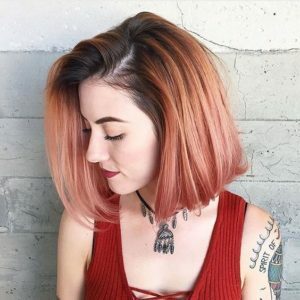 The messy waves give the bob a relaxed feel and gorgeous texture. Invest in a top quality sea salt spray to ensure that your blorange bob always looks beach ready, no matter the season. Give a boost to your ash blonde hair with a blorange ombre. You can go as bright as you like, or choose a more subtle blorange shade that almost has a sun-bleached effect. 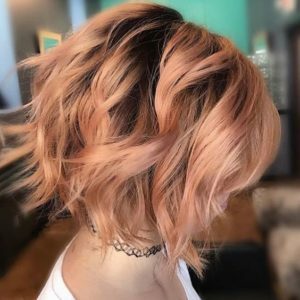 Add, some big bouncy waves to give your long bob extra depth and to bring out all the multi-tones that make up the blorange hair color. Blorange works particularly well with fairer skin tones, especially when it frames the face with some side swept bangs. 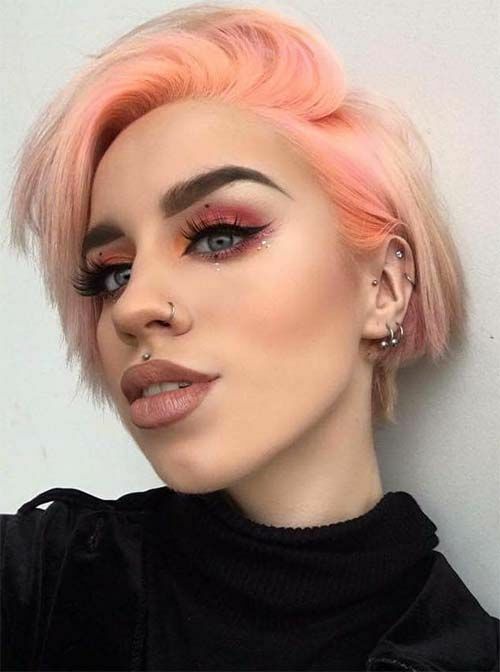 This retro shaped bob in vibrant blorange with subtle violet undertones brings a glow to a peaches and cream complexion, whilst also drawing attention to the features thanks to a matching lip color. Natural redheads can still rock the blorange trend without the dreaded color clash. Simply choose a blorange tone that complements your natural color for some bright balayage highlights. 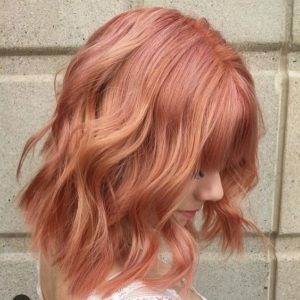 Brighter slices of blorange, like these which are closer to orange in color, are a great way to create the illusion of volume in finer hair, especially when given some messy waves. Blorange and dusky pink are two hair colors that work beautifully together. 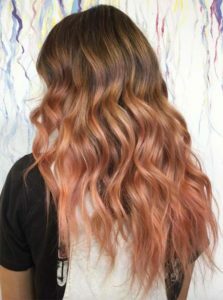 They harmonize wonderfully together in this wavy lob, which features a dusky pink base, with subtle blorange highlights. Slightly grown our roots allow the stunning tones of any blorange dye to really stand out. The eyelash-skimming bangs and face-framing tendrils will bring some brightness to your skin tone, whilst also making your eyes pop. Blorange hair will look both contemporary and chic when styled into a messy bun. It is a daytime look that is easy, effortless, and always on trend. 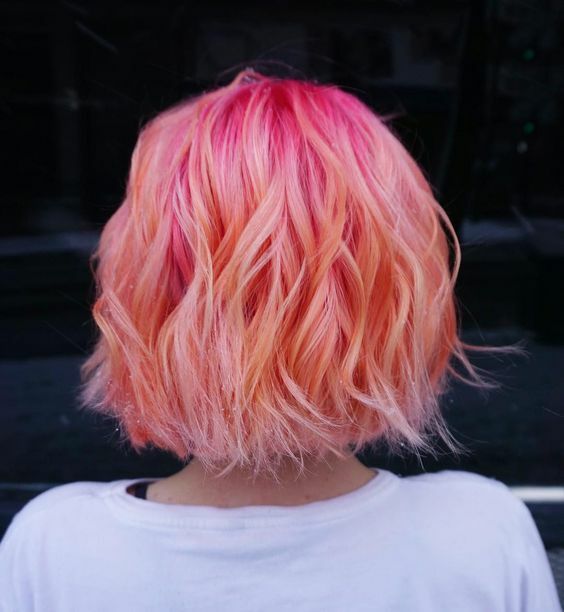 This blorange bob has the perfect compromise of hard and soft. The blunt bob cut is cool and edgy, which is juxtaposed with feminine curls and sugary sweet pastel shades. 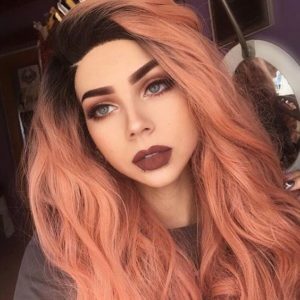 The model has perfectly emphasized the pretty colors of her hair with strong lips and a perfect cat’s eye flick of eyeliner. 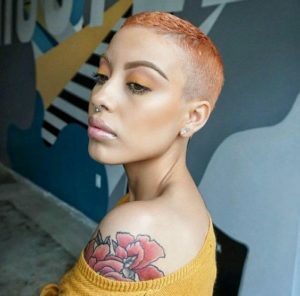 Blorange is given an added oomph in this stunning grown out pixie cut, thanks to a neon peach shade at the roots, which blends out to an icy blonde. The neon shade is bold, but it does not overpower the look as it is concentrated on the roots, almost like underlights. 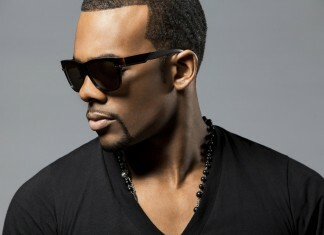 This use of color is extremely versatile – it will look just as good with brown, black or, red lengths. 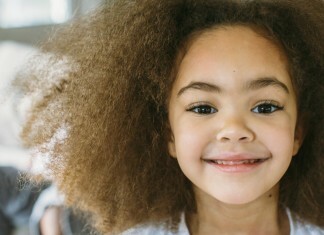 There is something magical about these big and bouncy blorange curls. 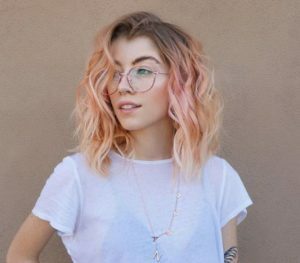 This whole look has a light and airy feel with the soft blorange tones and the random yet dazzling curls. These heavenly curls are perfect for giving some life to lank hair, or to give some control to hair that can be a bit unruly. Black roots and muted orange and pink tones make for a Gothic take on the Blorange trend. 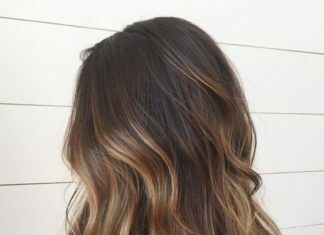 With dark roots, there is a danger that they will draw focus away from the hair color, but these muted, dusky blorange tone complement rather than compete with the black. The tousled styling adds just the right amount of softness, for a Gothic look any girl would love. For a look that really stands out from the crowd, mix your blorange tones with a neon pink. This knockout tousled bob features hot pink roots with peachy highlights, which makes a real statement. 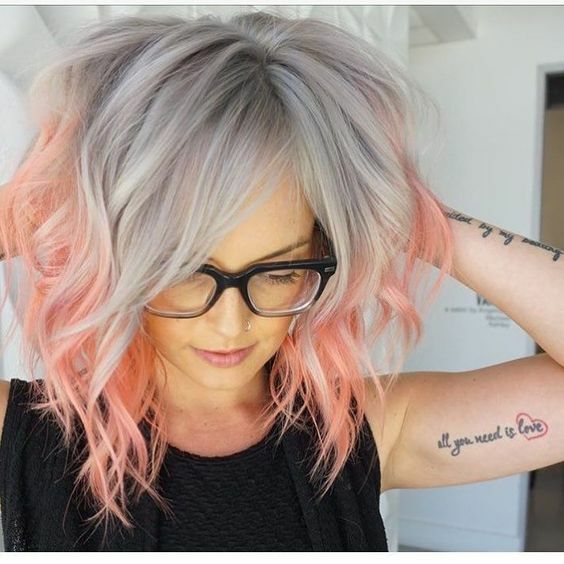 A look like this will probably be quite high maintenance, requiring many trips to the salon, but surely the outcome is worth it. 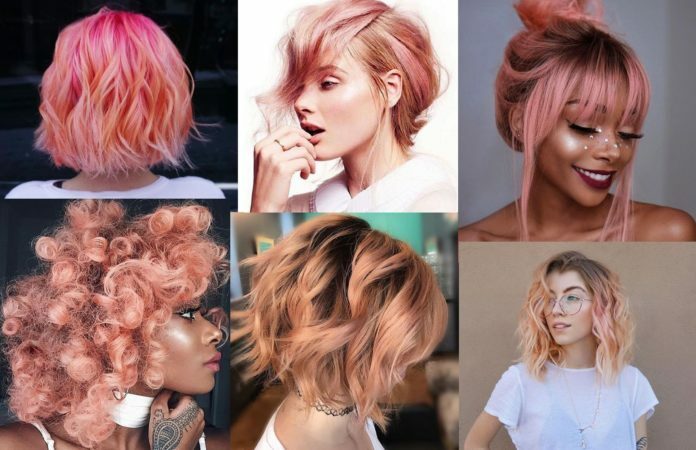 The spectrum of blorange hair goes from the bold and brash, to the soft and subtle. 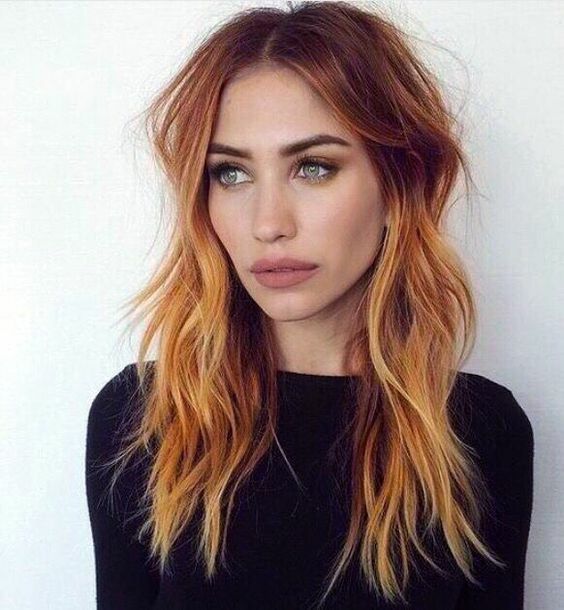 These pretty blorange highlights fall into the latter category framing the face and lifting a stunning ginger base. The resultant look is incredibly natural, but no less arresting. The blorange hair trend can even be incorporated into the shortest of hair, as this stunning extreme crop shows. The super short hair is given a touch of texture with a bright blorange shade. So cool and so contemporary. Pastel blorange and rose gold hues look stunning with paler skin tones. They highlight the natural glow of the skin, bringing out the peachy tones of fairer skin. This sensational asymmetric bob has a wonderful mix of rose gold, dusky pink, and pastel orange, which pop against the dark root and gives the model’s beautiful skin some extra radiance. Combine two of the hottest hair colors of the moment with a grey to blorange ombre. The pastel great shade has the slightest tinge of pink which allows it to blend with the soft blorange tones. The styling into loose waves is a stroke of genius, giving depth to each stunning shade. 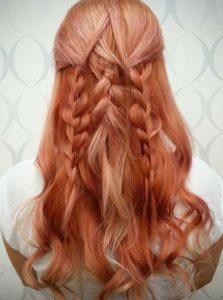 Style your blorange locks into multiple braids for a look that comes straight out of a fairytale. There is something about soft blorange tones that is angelic and ethereal, don’t you think? 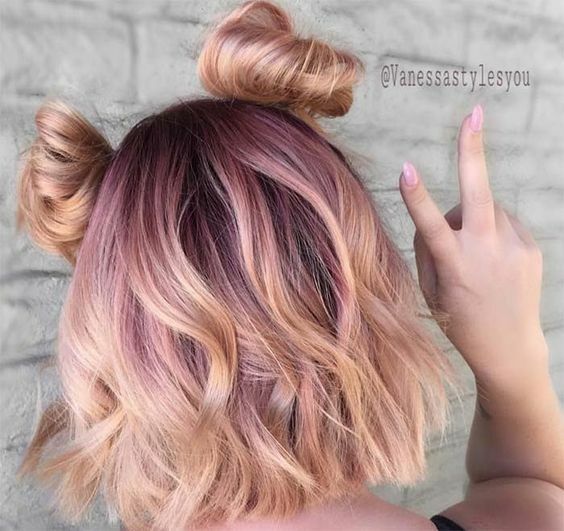 This choppy bob has been given the X-factor with a stunning balayage dye job that sees a lilac shade expertly blended into a light blorange. The curls and the brunette base gives hair some depth, whilst also allowing the colors to shine. The addition of space buns is a youthful and fun touch, perfect for such joyful hair colors. 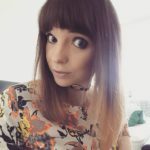 Whilst it seems like washed out blorange tones are the popular choice, you can make a real impact by opting for more vibrant tones. The blood orange tone of this mid-length haircut is a real show-stopper and the subtle hot pink and pastel orange highlights work brilliantly with the bold shade. 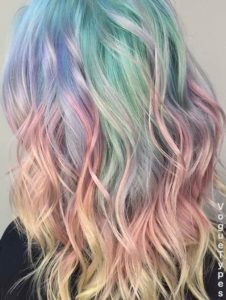 The good news is, that when these bright and vivid colors start to fade, you will get a whole new look as pastel tones develop. 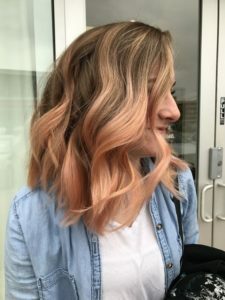 Ash brown or blonde hair serves as the perfect base for blorange, whether it be a liberal use of color, or a blend of subtly different blorange tones, like in this wavy lob. The addition of icy blonde highlights gives some contrast and the surfer girl texture keeps this look fresh and playful. Rich copper and deep red hues look particularly striking with pastel blorange tones. 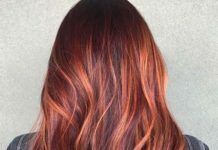 The saturated red tones complement the more washed out blorange shades, creating an ombre effect that is just remarkable. Reds are colours that work well with most skin tones, bringing warmth to cooler skin tones and giving an extra glow to olive skin tones. 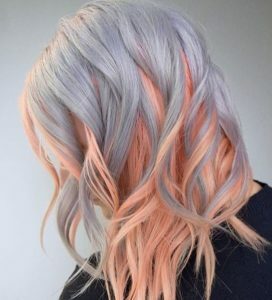 Blorange serves as the perfect undertone for the silver and lilac shades. 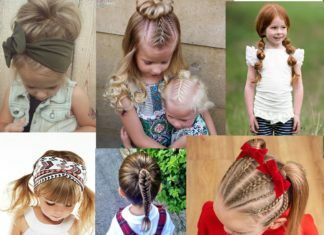 They somehow clash together and complement each other at the same time, for hair that is sweeter than a jar full of candy. The loose curls create a great peek-a-boo effect, whilst helping the two very different shades to blend together. 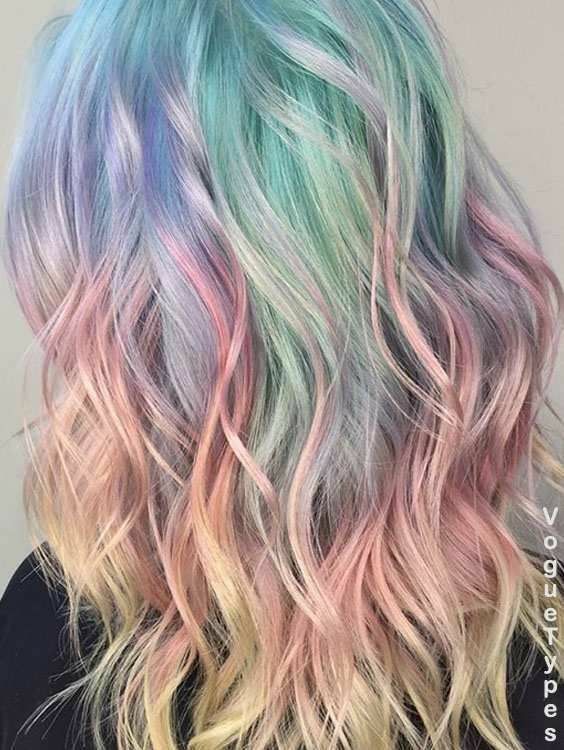 If you are looking for something extra colorful, take some inspiration from this rainbow style, which has incorporated some beautiful blorange shades through the ends of the hair. 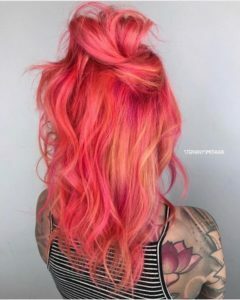 Peachy, blood orange, pastel orange, and delicate yellow tones blend together on the tips of the hair, completing the unicorn effect that is so popular this year.